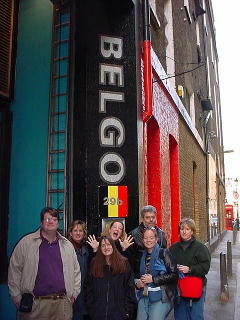 Here's Owen's photo of the group outside of Belgo Belgian restaurant in London. Belgo has delightful Belgian food and beer (but no real ale). If you are looking for a huge number of pubs with great atmosphere that serve real ale, there is no better city than London. Real ale is fresh, unfiltered beer that has been sealed inside a small cask. This beer leaves the brewery with active yeast still fermenting the sugars into alcohol and carbon dioxide. Once the cask arrives at the pub, the yeast is allowed to settle, the cellarman allows excess gas to leave the cask, and at some point the beer is tapped and served by hand pump to thirsty patrons. Air is allowed into the cask as the beer is served, so real ale evolves and oxidizes over the serving period of one to three days. The Campaign for Real Ale (CAMRA) is a grass-roots organization in the UK that attempts to preserve real ales and educate the public about the joys of drinking the product. CAMRA states in their real ale guidebook, "Real ale is not supposed to be warm, cloudy, or flat; nor is it supposed to have bits in it. It should be served well under room temperature, be clear and attractive, and have sufficient sparkle in the mouth." Cask-conditioned real ale can be some of the best beer you'll ever drink. The pictures below are not meant to represent all the best pubs in the city -- these are just a few of the best we had time to visit. 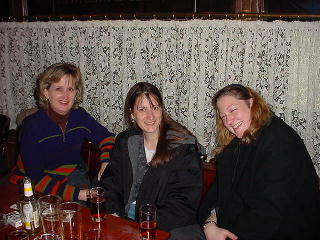 Here's Gail, Erin, and Kerri at the first pub we visited on this trip -- the Royal Oak. Pubs in London range from large, crowded, and noisy to small, friendly, and cozy. The Royal Oak definitely is the latter, and the range of wonderful Harvey's ales makes it a must-see. 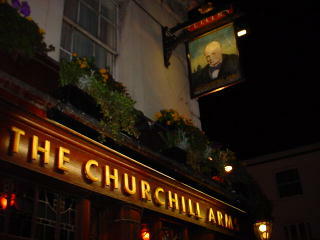 The Churchill Arms is in Kensington at 119 Kensington Church Street. This is a beautiful, large pub with a U-shaped lounge area. The Fuller's range of cask ales is available. 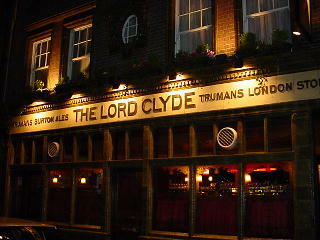 One of our first pub stops in London was the Lord Clyde in the Borough on Ayres Street. It features well kept real ales and elaborate emerald-green ceramic work around the doors and windows. Here's Dean ordering a pint at the Westminster Arms (9 Storeys Gate) just across the street from Westminster Abbey in the heart of London. This pub is a welcome sight for lovers of real ale -- the main bar is at street level while the comfortable dining area is downstairs. 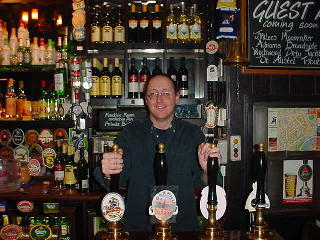 A number of well maintained guest real ales were available. Jeff, Dean, and Kerri wait for the lunchtime opening of the Museum Tavern. 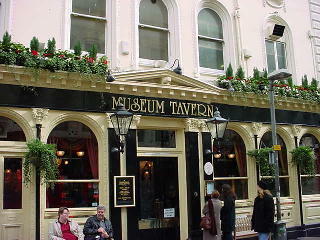 This attractive pub is just across the street from the British Museum at 49 Great Russell Street. This pub features some of the best pub food in London. The next few pubs were part of our Covent Garden pub crawl. 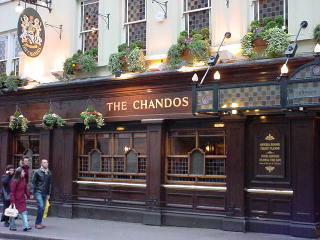 Candos can be found on St. Martin's Lane near Trafalgar Square. It features the delicious line of Sam Smith's beers. It also has a nice dart area in the back of the pub. 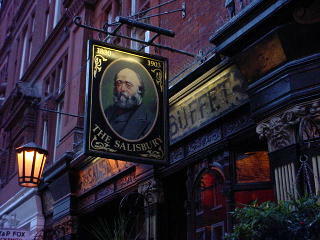 The Salisbury pub is across the road from the Chandos, and is full of atmosphere and mystery. It's real ales include Courage Best and Director's. The Round Table pub is on St. Martin's Court. We were very pleased to find cask conditioned Theakston's Old Peculier there. Old Peculier is a rich, dark old ale with loads of flavor and complexity. 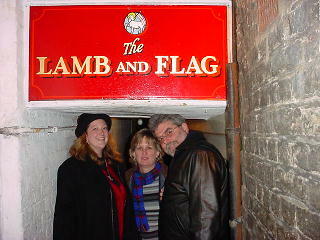 The Lamb and Flag is on tiny Rose Lane near the Round Table pub. It is an attractive two-story pub with a tiny walkway and short sign to the right of the main entrance. Pictured above are Kerri, Gail, and Dean squeezing their way through. 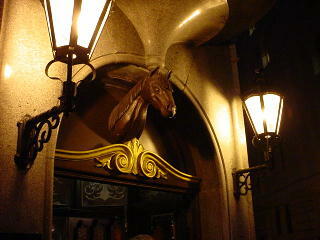 The Nag's Head was a favorite of Erin and Jeff and featured this gorgeous wood carving above the door. 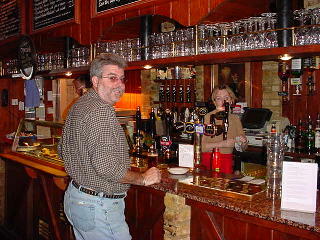 The pub is at 10 James Street near Covent Garden and poured the line of rare, interesting McMullen's ales. By far the best beer selection we found in London was at the Marquess of Granby pub at 51 Chandos Place near the Charing Cross tube station. Pictured above is pub manager Gene Hughes who takes great pride in his excellent, rotating selection of real ales -- including Timothy Taylor Landlord (an incredible ale with fantastic flavor and aroma hops). These huge grain storage tanks tipped us off that we were getting close to the Young's Brewery in the London suburb of Wandsworth. 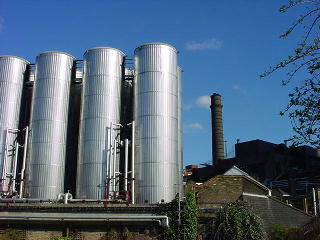 The Young's brewery is about a 20 minute walk from the East Putney tube station. Check www.youngs.co.uk for information on tours. 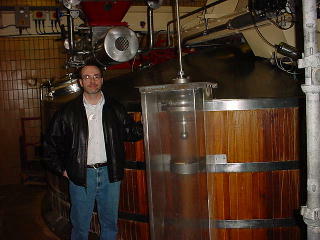 The brewery tour offered by Young's was extremely interesting and included a free pint of ale. Tours about five pounds ($7.50) per person. Here's Owen standing next to one of the many mash tuns at the Young's brewery. 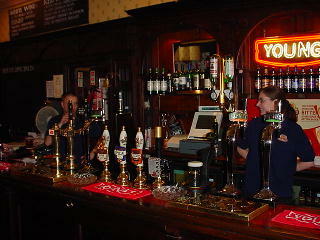 Young's is known for the quality of their beer and their dedication to real ale. 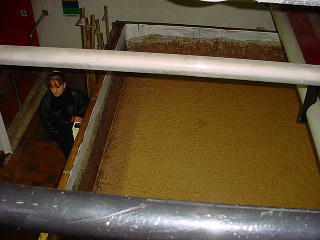 Here is our delightful tour guide at the Young's brewery standing next to a huge open fermentation vat of ale. The carbon dioxide levels in this place must have been amazing before the days of motorized ventilation. 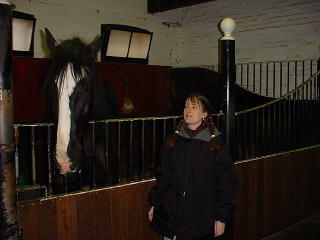 The brewery tour offered by Young's includes a visit to the stables behind the brewery where the giant horses are kept that pull the dray carriages loaded with Young's beer. This is Erin right before this dray horse wiped his nose on her jacket. 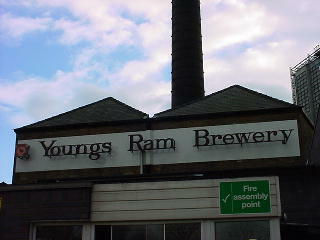 At the end of the Young's tour the beer lovers are treated to a pint in the Brewery Tap pub. The pub also has a gift shop where Young's souvenirs and bottled beers can be purchased for the journey home. 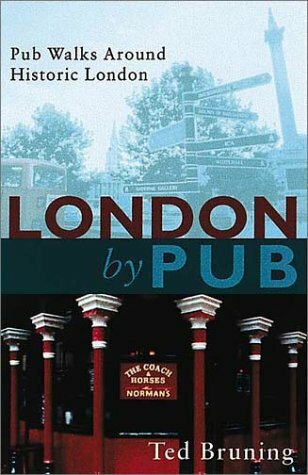 To find the best real ale in London, we suggest buying a copy of the paperback book "London by Pub" by Ted Bruning for some delightful, easy-to-follow real ale pub walks around the city. This fantastic book makes your pub journeys in London easy and productive. Order this book from www.trafalgarsquarebooks.com in Vermont. Are you on the hunt for the perfect internet web host? If you need a dedicated hosting website for all of your computer needs, make sure you do your research! Consider getting a Exchange Server Hosting that will meet all of your requirements! If you want a credibility in hosting, there are a lot of website hosting companies to choose from! Search the web for a hosting website that will provide all of the hosting requirements you need!